I was reading a non-glider related article on the internet, here . It included a picture of a Mountain Pika - a very cute little rodent - foraging for food. This mountain-dwelling pika is gathering food that will be stored for consumption during cold winter months. It's a hard task, yet studies show that rodents, given the choice, will opt to forage rather than eating the same food from a proffered dish. "We like projects. Animals like their projects as well," said Balcombe. "Why do big cats pace in a zoo cage? It's not like they'll die if they don't. They do it because they're highly motivated to move around. Just because something is a survival behavior, a very serious thing that needs to be done, doesn't mean there's no reward. Because it's crucial, it's probably rewarding." I am fascinated by this perspective. That an animal will chose to forage rather than take food offered in a bowl. Makes me really want to consider the whole glider/foraging thing some more! I just love to give my gliders as much exposure to foraging. They love it and I love it to watch them forage. Very interesting information indeed. Thanks for sharing. Thanks for sharing this, Alden. I love the idea of providing foraging opportunities for our suggies. It's what they do in the wild. They really seem to enjoy it and it gives them something to do to fight boredom. I just added several really neat foraging toys to our store site (see link in my signature). I especially love the 4-Way Forager and Bottom's Up Forager. They are very heavy-duty (made for big birds) & will last a very long time. We have an August special on Bucket with Bells too. We also make ball pits for our gliders out of cheap baskets from the dollar store & wiffle balls & other plastic toys. It's fun to put treats at the bottom & let the gliders dig around for them. That's a super cheap way to provide some foraging opportunities. Last edited by IowaMisty; 08/18/11 01:58 PM. About the ball pits. I've LONG noticed that my gliders love to hang around and burrow in them whether or not I put treats in them. They just LOVE their ball pits. I wonder if it is stimulating to them, and amusing? I just can't get over that thought - Animals *PREFER* to forage for their food rather than have it handed to them on a plate. I just keep rolling that over and over in my head. The fact that it is crucial to their survival probably ensures that it is also rewarding. Last edited by yiyo; 08/18/11 02:55 PM. 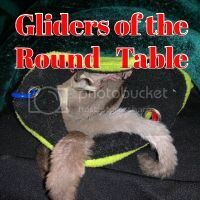 I'm sure every glider is different and maybe some just become too domesticated. But Alden, I agree.. ours love to play in their ball pits & we don't put treats in every time we offer them. When the gliders wake up & see something new in their cage to explore, you could swear it's Christmas morning for them. They go nuts! I think hiding their food a bit does tend to entertain them more. And especially if they're eating the same thing every night... it's good to find ways to make it more fun for them to find & eat it.